King of the Clams, the DUOTOU clams that are only available at Putien restaurant is now available again until stocks last. These seasonal dishes are only available during certain months of the year as it is directly harvested from the farm and import directly from China. 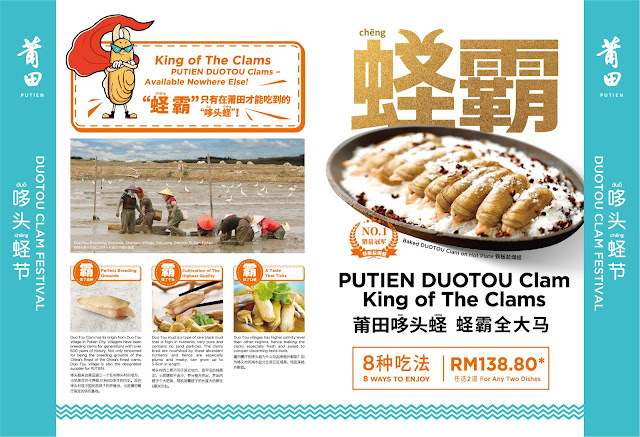 DUOTOU clams by PUTIEN are available in 8 cooking styles which show how they can taste different from every unique cooking styles. 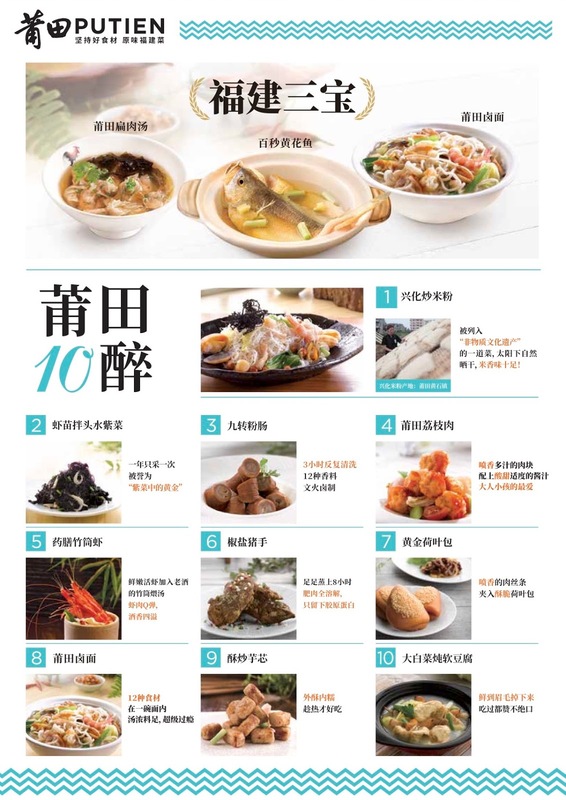 These fusion cooking styles not only features the usual cuisines available in PUTIEN but also other ways of making DUOTOU clams taste better and juicier. This cooking style is one of the best way you can taste the original taste from the DUOTOU clams and how juicy it is. Lightly salted with the salt pepper makes it rather addictive in every bite when you have it on its own and it tastes just like some really good snack. Enjoying clams in local style is to have it with stir-fried with sambal and chives. This dish is definitely delicious but we find the taste was too strong and overpowered the clams. However, this one is really good to go with some rice and you will just enjoy it like how most Malaysians does. Another way of enjoying it is to steam it with some minced garlic where not only it removes any of the fishy smell but also it makes the clams taste really delicious and juicy. PUTIEN cut all the clams into half before steaming them hence you can enjoy them to the max when you let every piece of the slip into your mouth. Another dish that could be great for a nice dinner with your family would be the omelette style that varies from the usual oyster omelette. The eggs match perfectly with clams and able to maintain the moist in those clams. No doubt this is one of the best ways to taste this enjoy the DUOTOU clams too. Chinese always like to cook their favourite food in ginger & spring onion style. Not because this is very popular but it is because this cooking style can best bring out the taste of most ingredients and also it is one of the most simple cooking styles that most people love. An exotic way of enjoying DUOTOU clams is to have it in kerabu style where you can taste spicy and sour yet very appetizing. We Malaysians would enjoy this dish whether as an appetizer or a main dish though the kids may not like it since it is a bit spicy. Another way of enjoying the clams' original flavour would be this option. It wasn't really salty but it is only a bit dry in this version. I would prefer the steam version more. The one we all like the most is this steamed version with fermented wine where the clams absorbed most of the wine and tasted so flavourful. I believe most people would love it especially the elderly where they can enjoy the freshness of the clams cooked in wine. 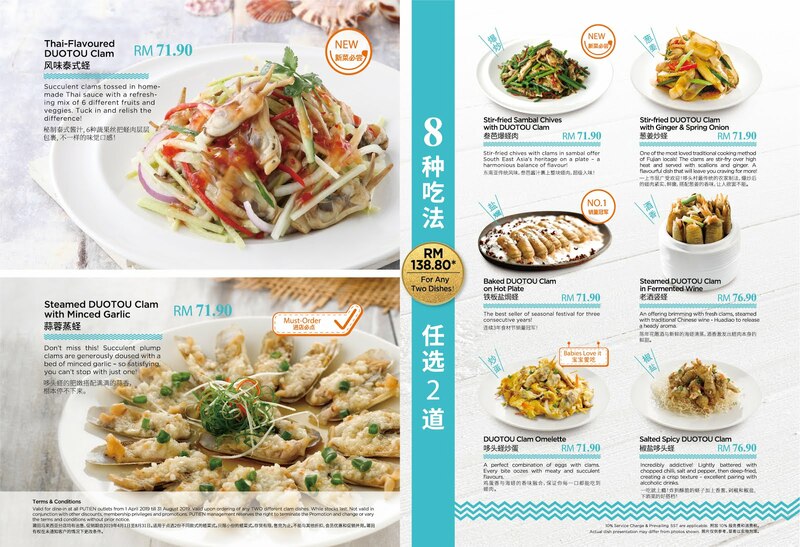 Don't forget to try other best sellers available at PUTIEN too! Persiaran Gurney, 10250 George Town, Penang.